Posts 1 through 10 for Anyone hit Rush this year? Been pretty quiet for Rush this year. I, as always, have spent a lot of time on Rush. For the first time...I was dealt a bad hand. I had to really work to find my wondering fish. It took about five more trips then I'd like, but eventually I landed on some of Rush lakes finest. Even got a photo up in Rush Lake Resort this year. 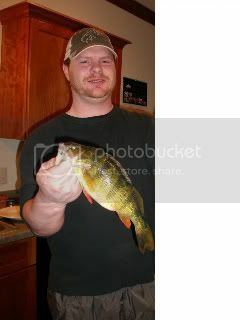 "Biggest Jumbo Perch of 2009-2010." For those city folks that don't know about this wonderful lake...it's only 15-20 mins. north of Forrest Lake and it is one great fishery! Go there and enjoy! Let me know when you head up again. They have been pulling houses all week. Not to brag but we have had a great year on rush. 10" limits were had in a few hours but you had to move untill you found em. The crappies have slowed down but were back into the sunfish, nothing to be proud of but good eaters. Also got a few jumbos off the island on the south side. Northerns have moved shallower too. Saw someone pull a 44" and keep it to eat that hurts me deep. fun lake to fish... I have also been into some nice perch on Rush and saw the largest pike I've ever seen under the ice. One time I went out and caught some fish not knowing the pike regulations and kept a couple northerns that should have been tossed back. Gotta keep an eye on those regs. or you'll end up in trouble. I actually never got in trouble but I posted a picture of the fish on here then felt like a dumb@$$ a week later when I figured out what I had done. Oh well. live and learn I guess. congrats on the biggest perch award. You should post a picture on here! Sand Burr, I'm busy early Sat., but if I get done with everything early enough, then I'll be out on Rush later. Seems like 3-sunset has been good. Oh boy...with a full moon coming in, and our last weekend of game fish fishing, I think I'll have to hit Rush. I'll add a couple pics of the last couple weeks results, and include the Jumbo Perch. It's not LOTW or Dakotas quality, but for this area it's a good one! **Hey Webdude, I've been trying to add pics forever and I just don't get it. Can I email them to you? Please do... and I'll post them for you. Here is my big one from Rush this winter. Hope this works.